I hate to spend time pointing out issues, but sometimes the fastest way to get things moving in the right direction is by calling out the mistakes. Below are 10 prospecting mistakes too many salespeople make and there’s zero reason for anyone to be making them. Your objective should be to read them and take corrective action. While you’re at it, do yourself a favor and check out my new book, High-Profit Prospecting. 1. Failing to schedule time to prospect on a regular basis and sticking to it. You take a shower everyday and that means you prospect everyday. Thinking about prospecting or saying you’ll get to it when you have time is not an option. You’ll never devote the level of time needed. 2. Sending emails that aren’t smart phone savvy! We all write our prospecting emails on a laptop or desktop computer and think it looks great. News flash: The person you’re sending it to is most likely viewing it on a smart device of some type. This means it’s a small screen, where your email can look pretty junky and overwhelming (that, by the way, is an invitation to have it immediately deleted). 3. Failing to ask for and leverage referrals. Few people will ever be able to keep their pipeline full just off of referrals, but regardless of what you sell, referrals are an easy source for new leads. 4. Starting what you can’t finish! This one drives me nuts, but I see way too many people throwing out a bunch of emails or making a bunch of phone calls and thinking they’re done. You must have a plan to follow up. “One and done” is not a prospecting strategy! 5. Failing to realize voicemail is an effective prospecting tool. Just because you don’t like voicemail doesn’t mean your prospects don’t. Knowing how to leave a great voicemail is a very effective tool. Let’s not kid ourselves — the number of call backs you get is going to be low, but hey, what kind of active engagement rate are you getting from sending out emails? 6. Thinking email is the only way to prospect because you can send hundreds and thousands of emails quickly. 7. Thinking social selling and pushing a ton of content out on social media sites will make the phone ring. It’s a cluttered, noisy world and guess what, everyone else is doing the same thing. Just because you think what you write is great doesn’t mean others will too, and it certainly doesn’t mean anyone else will even see it! Social media is good and I have no issue with the idea of “social selling,” but its best benefit to you is helping to create credibility as to who you are and what you do. Sure, it will create some leads, but over reliance on social media will most likely leave you with hungry children! 8. Taking an idea from one industry and thinking it will work for yours. This is really painful for people who listen to social media that tends to be driven by tech companies. Recently, a very tech savvy salesperson shared with me how effective Twitter and Instagram are for him to develop prospects. It might work for him, but I can show you hundreds of industries where people have zero clue as to what Twitter or Instagram are. The same goes for email, telephone and every other form of communication. Each industry has their own nuances, and to be successful, you have to know what they are. 9. Thinking more is always better. I hate to inform you of this, but we all have way too much “more.” The last thing we want is more of anything. The ability to be brief is key to prospecting today. Just as the capabilities presentation that used to be the norm 10 years ago has gone away, so too have the lengthy emails, lengthy messages, and lengthy everything. The shorter and tighter your content, the more respect you’re showing the person you’re trying to reach. Time is the new currency! 10. Thinking more leads is always better. Sure, we all want more leads, but what we really want are better leads. Too many salespeople have sales pipelines that are so full of leads they’re plugged up, making them essentially a sewer line! Your objective is not to have more leads, but to have better leads you can move through quickly. The sales pipeline you want needs to be your water tap, delivering fresh water instantly. Make it your focus to qualify faster to allow you to keep your pipeline clean, allowing you to spend more time with fewer prospects. The result is pretty simple. You’ll close more sales! 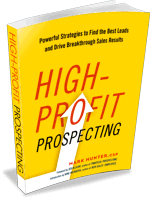 Do yourself a favor and check out my new book High-Profit Prospecting. And yes, you’ll find plenty of proven strategies you can use immediately to ensure you’re not making any of the 10 mistakes I just shared. Good stuff! I am seeing Social Selling everywhere and like you agree that there is a benefit and a need to project yourself as an expert in your field, but nothing can replace the eternal basics of phone, email, and in person sale experience. Love these! Agree – we all have “too much ‘more'”! Quality prospects are worth way more than any quantity of weak ones.